When your sprinkler system springs a leak, you need to find and repair it as soon as possible. 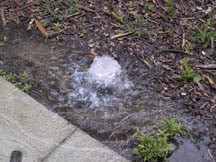 Finding irrigation system leaks can be difficult but it is important to do so quickly. Leaks in lawn watering systems are one of the toughest to locate. Sometimes, they can be much further away from water seepage than expected. PVC – PVC pipe is white and usually connected with pipe glue or cement. It can also be connected using Teflon or other pipe tape. Copper – Copper sprinkler pipe is durable and long lasting. It has a reddish hue. Galvanized – Galvanized irrigation line looks like rusty pipe. Like copper, it is strong and provides many years of use. Poly – Poly pipe is a flexible pipe. It is also known as funny pipe and is used for areas that are curved or have interesting shapes. You need to know the difference between the type of water sprinkler pipe used in your garden sprinkling system because some types of irrigation pipe must be completely replaced while others can just be repaired. You first need to find out what exactly is leaking. 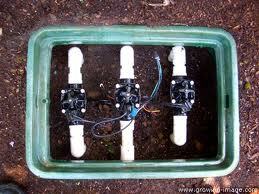 To find this, take a look at your water meter and see if the trimeter is moving. The trimeter is the smaller meter located in the center of the larger meter. If it is moving, you have running water that is running from the meter to your home. Turn off the water at the main valve where water enters the house. This cuts the water supply to your house and can answer a few questions (the water that is making the meter move is not a toilet or dripping faucet, etc). Now that you have turned off the house's water supply, take a look at the water meter to see if the meter or trimeter are moving. Next, locate the main water Orbit sprinkler valve. It should be located in a valve box in the ground or in a flower bed. Turn off the sprinkler system's main valve. Take another look at your water meter. If it is still spinning, you have successfully determined that your leak is located in the main water line. Then, look at the wet spot where seepage is occurring. Check the ground slope and find the highest point that is still wet. Follow the slope downward until the ground gets softer. Start digging for the sprinkler line and be careful not to dig too hastily as you may damage the water line. The irrigation sprinkler line should be within 18 inches of the ground level. If you have not found the sprinkler pipe after digging 18 inches deep, look to see where the water is seeping. Start digging in that direction until you find the leak. Now that you have completed the most difficult part – locating the leak – you can take steps to repair it.